This local food pantry opened its doors in July 2007. It serves the residents in Oxford who are in need of food assistance. The pantry is located on the grounds of Mt. Olivet Cemetery (corner of Locust St. and College Corner Pike). Volunteers are needed as receptionists, shopping assistants, parking attendants, sorters and stockers, and upkeep helpers. The pantry also accepts unopened non-perishable items any time. Donation of items can be arranged by contacting the pantry or they can be dropped off at the parish office during parish business hours. 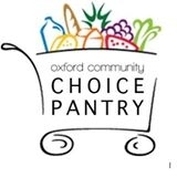 For more information or to volunteer, contact the Choice Pantry at (513) 523-3851 or email oxchoicepantry@aol.com. Miami Students can contact The Office of Community Engagement and Service at Miami University. Mondays 5:00 p.m. to 7:00 p.m.
Thursdays 5:00 p.m. to 7:00 p.m.
Saturdays 2:00 p.m. to 4:00 p.m.